In this video, you will learn the three ‘marketing events’ that must happen in sequence before you can get a customer to try your restaurant. Obviously if your ideal customers are unaware that you exist, then they will never visit your restaurant. However Brand Awareness is more specific. Your potential customers may be aware of your restaurant, even walking past it every day on their way to work. However they may not know the restaurant’s Brand Position. That is, what type of cuisine, what is the price level, the service, what sort of customers do they have? Unless they have this information, they are unlikely to consider visiting your venue. So how do you overcome the lack of Brand Awareness? You go fish where the fish are. And they are on social media. What are they doing there- they’re watching videos. There are 8 billion video views each day on Facebook and 5 billion daily views on Facebook. When you add mobile phones to the equation, then it really gets interesting. No virtually everyone has a mini TV in their pockets. Within 12 months, 75 percent of all mobile viewing will be online video. So what does that mean to your restaurant? You need to be creating videos now. If you don’t, you will be missing out on most of your potential market. No Trust = No Customers. That is the simple equation. In order for someone to visit your restaurant for the first time, requires a degree of trust. No-one wants to risk a special occasion or waste a night out for a bad experience. The best way to create Trust is for your ideal customers to see for themselves. And they don’t need to be any where near the venue. Video allows viewers to see for themselves how the food looks, and the venue. 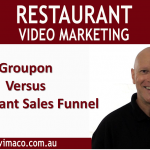 More significantly, video allows real customers to give testimonials, inside the restaurant. Nothing is more powerful than a ‘third party’ review. Customers’ expectations are that the money they spend equals the value they receive. But if you really want to drive new customers to your restaurant, then tilt the scale more their way and give them more value. In fact, use the Godfather Offer – one that they cannot refuse. A poor offer, such as a free piece of garlic bread will simply be a waste of your ad spend. If you know your customer’s Lifetime Value, then you know how much you can give away to get a customer. For example, the average Customer Lifetime Value for Starbucks is $14,099. With that insight, how much would you invest for one new customer? So what is the most effective way of creating these 3 Marketing Events? Well you can achieve all of this in just 15 seconds. How? Simply use a Facebook video ad which will help you to create Brand Awareness, trust and deliver Value through an e-coupon. For more information about getting more customers for your restaurant, download this free PDF for the Restaurant Sales Funnel Recipe.